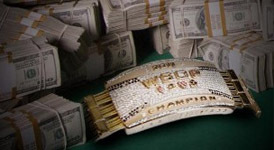 The 2011 World Series of Poker Main Event played down to 22 players on Day 7 –five more eliminations than was expected—and hopes for an Erick Lindgren, “Doc” Sands, JP Kelly, Tony Hachem, David Bach, Andrew Brokos, Sebastian Ruthenberg, John Esposito, and Steve Brecher final table were dashed yesterday as all of the previously mentioned players fell by the wayside –as did the last Woman Standing Erika Moutinho who finished in 29th place. Despite the loss of nine well-known poker pros, the 22 remaining players have some name recognition of their own, as well as few young players proving they know how to play this game. Still alive in the field are 2011 WSOP Player of the Year front-runner Ben Lamb, Phil “USCPhildo” Collins, Bryan “Devo” Devonshire, Lars Bonding, and 2011 WSOP Circuit National Champion Sam Barnhart. Some of the unknown players in the field who were very impressive over the past couple of days were chip-leader Anton Makievskyi, Ryan Lenaghan, and Matt Giannetti. But truthfully, I haven’t seen many mistakes from any of the remaining players, and all seem to be very solid players. There were a few blowups on Day 7 as three players saw their big stack crumble, and only one of them was able to overcome a major blow and rebound, Ben Lamb. Lamb got into a pre-flop raising war with pocket Jacks facing a player who had yet to get out of line in Eoghan O’Dea, who ended up turning over KK after both players put 6+ million chips in the middle. Despite losing half his stack, Lamb managed to once again chip-up and ended the day with over 14 million chips. Another player who “blew-up” were Brazilian Hilton Laborda, who lost a huge pot holding a flush to his Matt Giannetti’s fairly obvious full house, and then a few hands later was coolered when his nut-flush lost to another full house of Gianetti’s –this one far less obvious. The final blow-up belonged to Frenchman Guillame Darcourt who got out of line with AJ against Ben Lamb, losing nearly 5 million chips, and then had the terrible luck of running his KK into Bryan Devonshire’s AA –Darcourt was eliminated soon thereafter. This entry was posted on Tuesday, July 19th, 2011 at 9:27 am and is filed under Poker News. You can follow any responses to this entry through the RSS 2.0 feed. You can leave a response, or trackback from your own site.